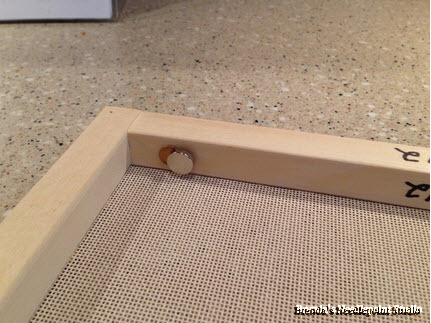 July 11, 2013--When I first began needlepointing 3+ years ago, I was given some wonderful advice on how to mount canvas onto stretcher bars. This advice came from Liz, the owner of Needlewoman East in Falls Church, VA, and I hope you find it helpful as well. She recommended attaching the canvas so that it appears to be on the "back" of the stretcher bars, as shown below, rather than on top. This keeps your wrists and arms off the canvas, and your work cleaner. By attaching tacks to the inside of the stretcher bars, magnets can be placed on the tacks as needle holders, etc. When your work is put away in a bag, the needles and threads are protected by the sides of the stretcher bars and won't fall off. I often place tacks on top of the bars, and use another magnet to hold graphs in front of me while stitching. Another reason for "stitching in the well"....if the margins of your project are very narrow, you won't have trouble ending your threads on the back because there isn't anything in the way. 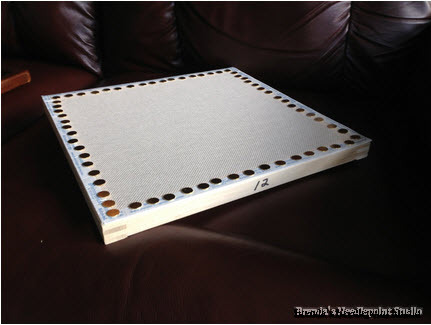 Bead holders placed inside the stretcher bars won't fall off the canvas either. For some, using a laying tool in a tight corner is difficult unless the canvas is on top of the stretcher bars. I use a "trolley" type of tool--it's a long, large needle welded to a ring that I wear on my index finger. I can then curve my finger around a tight area....or just turn my canvas around for more maneuvering room. 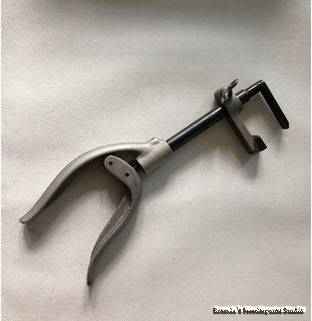 This is a "framer's tool" I use to push tacks against stretcher bars. The handle is very comfortable to use. 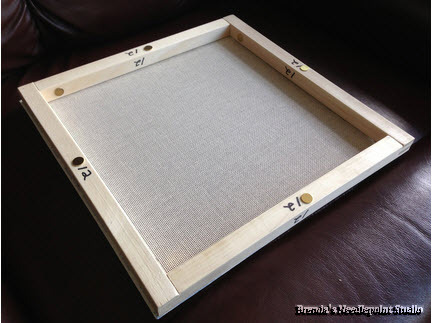 Jane of Chilly Hollow found a website for this tool, called a picture framer's bradset, at Highland Woodworking. Thanks Jane. There's another school of thought that advocates attaching the canvas to the top side. Attaching it to the top makes it easier to do a lot of the specialty stitches, lay threads, and place stitches close to the edges and corners. It also helps prevent the tacks from loosening (and sometimes popping out) as a result of the tugging and pulling that many stitches require. This is how I was taught when I took my first class in charted canvas. And it's pretty much a preference, what way feels better and more natural. 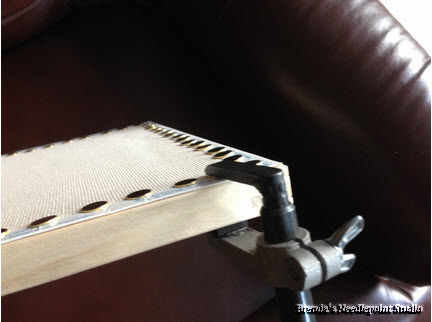 When I use a roller frame (usually for cross-stitch and counted-thread on evenweave and linen), however, I always attach it to the underside so that I'm rolling my stitching up inside as I go, keeping it clean. Hi Sara. These are very good points for top side stitching. I do the same with scroll bars as you. Thank you for your comment and happy stitching.